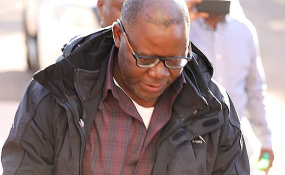 MDC Alliance principal Tendai Biti related before a Harare court Friday the gripping tale of his dramatic escape bid to neighbouring Zambia with suspected state agents in deadly pursuit while relatives were viciously harassed back home. The former finance minister was returned to Zimbabwe by Zambian authorities after the Lusaka government rejected his asylum application and also ignored a local court order barring his deportation. Biti is accused of contravening the Electoral Act after he allegedly declared MDC Alliance leader Nelson Chamisa winner of the presidential vote in the July 30 elections. He is further accused of inciting public violence as deadly clashes rocked Harare following confirmation by the Zimbabwe Electoral Commission that incumbent Emmerson Mnangagwa had defeated Chamisa. Explaining why he decided to leave the country, Biti said he had never felt more threatened in his life. "A series of illegal things kept on happening. My family was threatened and my relatives, my family," he said. "I have been a human rights lawyer, an activist and politician since 1999. I had my house bombed in 2008 but nothing beats the nature of threats I had for the last seven days. "I have never felt so threatened." He added; "We also had reports of some (party) members who had their private organs split by guns at the hands of soldiers. It was frightening. "There was a massive onslaught against our polling agents. In fact, they visited every home of our agents who they suspected had V11 forms and terrorised them." Following the deadly clashes between opposition supporters and the security services, a ZRP spokesperson told State media that police were keen to interview Biti in connection with the violence. However, the People's Democratic Party (PDP) leader said when his attorney, Alec Muchadehama, visited CID Law and Order on August 2, detectives there said they were not aware police were looking for Biti. "Right up to Monday 6 August, no one from the police called. We believed someone other than the police, was controlling things and this case," Biti told court Friday. "My other lawyer Harrison Nkomo went to CID on Monday (August 6) and told them I was going to surrender myself to genuine police not junta police. "We were contemplating that they (lawyers) would accompany me to law and order in their hundreds but there was an indication from the lawyers that law and order was not in charge but someone else." It was the agreed that the opposition politician would not surrender himself to anyone other than police. A guarantee was also sought from ZRP Commissioner General Godwin Matanga that Biti would not be handed over to any other authority but Matanga did not respond. "It was clear there was no guarantee," said the PDP leader, adding that it was then decided that he seeks political asylum in Zambia. "The police said they had nothing to do with all this. They could not help me. Some people wanted to help me to skip the border, but I wanted to go lawfully. "I did not want to offend the country I was going to." According to Biti his lawyer sought asylum immediately. "In order not to attract attention I was lying on my back," he said. He said the lawyer suspected they had been spotted because traffic was building up at the border. Biti claimed he was then suddenly taken by suspected Zimbabwean authorities who refused to identify themselves. He said an immigration officer told him that they were taking him back to Harare, but he refused, indicating that only Zambian police or authorities could take him or arrest him since he was in Zambian land. He said some 15 people then forcibly lifted him to their vehicle. "A tag of war happened. Some Zambian women protested the incident and started pulling me away from the Zimbabweans," he said. Confrontation ensued over territorial issues between Zambian and Zimbabwean officials with the former refusing to release Biti after which he then sought asylum in terms of SADC protocol. "But the Zambians were afraid because many violent Zimbabweans were arriving. "Zambian immigration officers and police then smuggled me out of the border post and I managed to escape to a Zambian police station." According to Biti the suspected state agents thought he had escaped to Lusaka and flooded Lusaka and Kariba road while some were stationed around police station at the border. "Chirundu police needed reinforcements in their own country because they were outnumbered by Zimbabweans who wanted to take me," he said. Three sets of lawyers then filed urgent court applications in support of Biti and an order was granted for him to stay in Zambia. Biti said the Zambian police wanted him to go to Lusaka, but there were communication challenges since he was still using Zimbabwean mobile phone lines. "I had no problems with sleeping in the cells, but we realised that the people who were after me would come and get me. "The Zambian police extended a toilet to accommodate us because it was dangerous to stay in a cell. The smell did not bother us; life was at risk," he said. He said the Zambian police wanted to help him as much as possible. The following morning around 4am the court order in his favour was served to both the Zambian and Zimbabwean authorities. "In terms of the order, I was to remain in the hands of Zambian immigration authority, "he said. Armed with a court order, Biti believed he was now protected, but soon after receiving the document, suspected soldiers in balaclavas stormed the police station armed with guns and ordered him out. "They brought three soldiers who had balaclavas. I don't know if they were Zimbabweans or Zambians; they had guns and were in uniform. "So, we were ordered outside; we wouldn't have resisted because there were guns now. "We learnt afterwards that the lawyers had been chased away and immigration officers who helped us on the first day." Biti was driven back to Zimbabwe in unmarked vehicles and notified of the charges he is facing. The PDP leader told court that is mother was made to sing hymns all night while being ordered to disclose his whereabouts while a brother was shot at while driving in Greendale with his two sons aged 6 and 19. The 90-year-old mother of a friend was also terrorised by his tormentors. Biti is challenging his arrest, arguing that he was unlawfully returned to Zimbabwe in violation of international immigration law. The case was remanded to next Wednesday when the State intends to bring its witness. Magistrate Francis Mapfumo is presiding over the case. Biti being represented by several lawyers, including Alec Muchadehama, Beatrice Mtetwa, Harrison Nkomo, Gift Mtisi and Jeremiah Bamu.